Earlier today, I had to download a PDF document from scribd.com but I didn't have any account in scribd.com and I have coded a script that would help me download the PDFs from scribd.com without any account. To access the service, visit this link. It will ask you for the URL of the PDF document. Just copy and paste the URL from address bar when you are viewing the PDF in scribd.com. Note: Many people emailed me that the tool is not working. In fact, scribd has changed the way the documents are downloaded. Once I find the new bypassing method, I'll redo the script. Today I tried to update my ubuntu 10.10 but unfortunately, I found the error regarding the GPG keys saying the signature could not be verified. A simple solution for this is presented in this post. My solution was to update the keys using the same hex number shown in the error. This is a very useful two lines code that can be pretty dangerous if executed especially if there's a higher privilege in the windows OS(works well on XP, not tested on other windows versions). The above line of code deletes everything recursively without asking for any confirmation. Now save the file as filename.bat and send it to your friends or anyone whose system you want to kill. On clicking this batch file, very bad things are gonna happen. So be warned not to click when the file is in your system. This tutorial is written by mango1122 from governmentsecurity. Since its very informative, I have decided to post this tutorial over here. The Berkley Internet Name Service (BIND) is the most common form of DNS server used on the Internet. and then finally the DNS server. The result returned will then be cached by the client for a small period of time. answer it needs which is passed back to the client. This process is known as recursion. 1. The client will contact its configured DNS server and ask for www.google.com to be resolved. This query will contain information about the clientâ��s source UDP port, IP address and a DNS transaction ID. to note here is that each query for google.com is assigned a different transactio ID. this will be the same source port used when the victim sends the queries for the domain to be hijacked. the attacker controls to query the target name server for a hostname for which the attackerâ��s machine is authoritative. Another alternative would be to use a packet sniffer. response times for legitimate requests. queries the target name server. Clearing the local cache will ensure the resolver gets the information from the server and not locally. If this attack was multiplied from a number of machines then the impact would be even greater. Today I encountered this error and I thought it was related to HDD issues. So I used fsck which is a command line tool to check and repair the linux filesystem. So I am writing this short how to so that it might be helpful for you as well. Replace /dev/sda1 with your target filesystem partition and press enter. Whenever any fix or overwrite permissions are asked, press y. After finishing the repairing, reboot your system from hard disk. The system should boot without any error now. By default, the installation of any windows program is done in the [System Drive]/Program Files directory and in the case you want to change this setting, a simple registry hack is enough. I've already discussed on how to change mac adress of your ethernet card under windows as well as linux. One more such tool which is command line tool, is etherchange. EtherChange can change the Ethernet address of the network adapters in Windows. Download the exe file and run it from a Command Prompt. It will give you the instructions you need. EtherChange only works if your account is in the Administrators group. Do you want to download the undownloadable books from google books? If yes, here's the solution for you. For more details on the script and how to use it, refer to the official site. The script is available at userscripts.org collection. I was testing the psychostats script today and while testing I found that it displayed lots of warnings and notices that make the script look so bad as the output is totally messed up. This post will help you to fix this problem. At first, I tried to change the error_reporting and display_errors setting in php.ini file but I could not get rid of those errors. So I then put a line of code as below at the top of index.php file of psychostats. Still no luck. Finally, I navigated to ./includes relative to psychostats root folder where there was a file named class_PS.php. Open this file and type the following line below <php line. This will suppress all those errors and will make your psychostats look better. I hope this helps. I've been playing counter strike for a while through wine and so far, most of it works well. With getting more and more better with the game, I've learnt the importance of sound in this game. 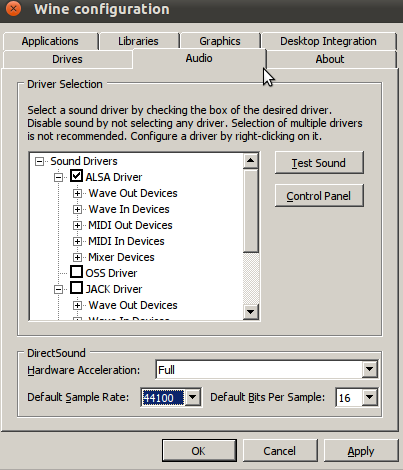 Unfortunately, the sound was not working properly and with some experiments, I've found the solution for me. I hope it also works for you. 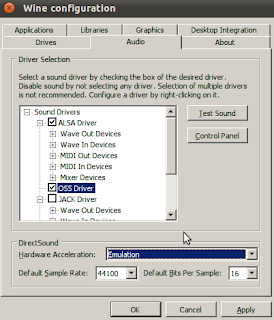 Now, you need to edit the settings to match as in the following image. 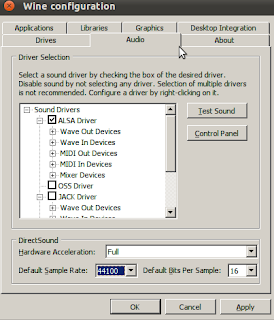 After changing the audio configuration, click on Apply and then restart Counter-strike. I guess this will work for you as well. I was downloading the metasploitable to play around with it and I found that it was the VMWare .vmdk file so I had to convert it into .vdi file to run under the virtualbox. This post will show you how to easily convert the .vmdk file into .vdi file. Converting the vmware disk file to the virtualbox hdd file is not the difficult task but still many might not be knowing how to do that. In order to convert your .vmdk file to .vdi, you need to type the following command in the terminal by first changing the terminal to the proper directory. So you are wondering how you could compress your 2gb game data into less than 100 MBs? 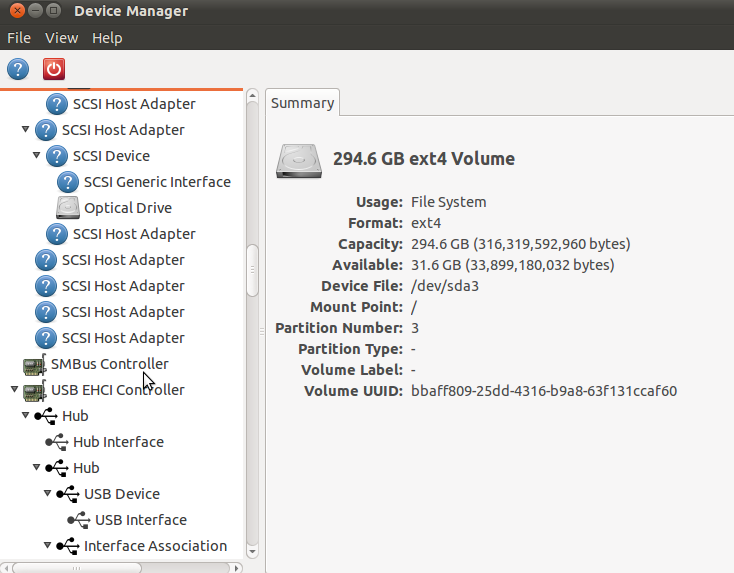 Are you lacking hard disk space and want to store files in the compressed form? If yes, then this post will direct you towards the solution. KGB Archiver is the compression tool with unbelievable high compression rate. It surpasses even such efficient compression tool like 7zip and UHARC in terms of the abilities. KGB Archiver uses AES-256 encryption to encrypt archives. While the compression ratio is very high, it requires relatively high PC specification and it also requires more time to compress and decompress the file. But still this compression program will come in use sometimes. For more information and download, visit KGBAarchiver's sourceforge page. MDD is a physical memory acquisition tool for imaging Windows based computers created by the innovative minds at ManTech International Corporation. MDD is capable of acquiring memory images from Win2000, XP, Vista and Windows Server. This tool can be pretty useful to analyze the data present in RAM. Whenever we are running programs, RAM stores various range of information being used by the program. For example, if we are running a web browser, the RAM may contain the URLs being visited, form data, etc. So you can just guess we can extract a lot of information from RAM. Thus, MDD can be very useful tool to dump the physical memory into the file from which we can extract the required information. You can read more and download the tool from MDD SourceForge Page. If you've forgotten your ubuntu user password, it is still possible to recover the account by resetting the password. The recovery mode option in the grub menu can be used to reset the ubuntu user password as this mode lets us drop to the root shell prompt. To reset the password, first select the recovery mode from grub menu. And then you'll have to select the "Drop to shell prompt" option. Now you can simply reset your password by using the passwd command. WackoPicko is a website that contains known vulnerabilities. It can prove as a very efficient way to master web hacking skills. This project is similar to Damn Vulnerable Web Application and is a collection of common web vulnerabilities. For more information and downloads, you can check the WackoPicko github page. The query parameter is vulnerable. The comment field is vulnerable. The session cookie value is admin_session, which is an auto-incrementing value. The first name field of the register users form contains a stored SQL injection which is then used unsanitized on the similar users page. The username field is vulnerable. The tag field has a directory traversal vulnerability enabling a malicious users to overwrite any file the web server uses has access to. The comment field is vulnerable to XSS, however must go through a preview form. The user doesn't have to purchase the picture to see the high quality version. The password field is vulnerable to a command line injections. The page is vulnerable to a file inclusion vulnerability, however you have to include at the end. The userid parameter can be manipulated to see any user's page when you need to be logged in otherwise. The name parameter is vulnerable. A coupon can be applied multiple times reducing the price of an order to zero. The coupon in the initial data is SUPERYOU21. The value parameter is vulnerable. There is a default username/password combination of admin/admin. Phatch(Photo + Batch) is an user friendly, cross-platform Photo Batch Processor and Exif Renamer with a nice graphical user interface. Phatch handles all popular image formats and can duplicate (sub)folder hierarchies. Phatch can batch resize, rotate, apply shadows, perspective, rounded corners, … and do much more actions in minutes instead of hours or days if you do it manually. For more information on Phatch, you can visit HERE. Actions: resize, rotate, invert, flip, watermark, shadow, rounded corners and much more! Nepal Telecom is providing GPRS service in its both pre-paid and post-paid services. I am posting the general setting to use the GPRS service of Nepal Telecom. I've written a small code snippet that will work as HTML parser for use in your blogs. It can be useful to put the google adsenses and to post source codes in your blog. Obviously it might have other usages but I am using it for posting source codes. We can use lspci command to list and determine the PCI devices from the terminal but most of us want some graphical way to view the PCI devices connected to our system. In this post, we will discuss two such GUI tools. 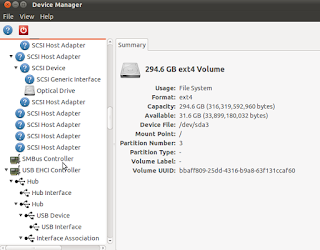 This is a GNOME program to manage devices and device drivers. It's inspired by hal-device-manager, from the HAL project, but rewritten in C for efficiency and an outlook to actually make it manage devices rather than just show information. 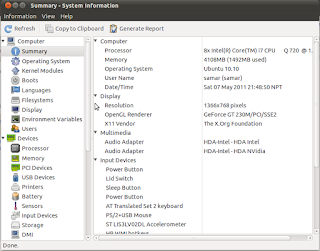 HardInfo is a small system profiler and benchmark application that displays information about your hardware and operating system. Currently it knows about PCI, ISA PnP, USB, IDE, SCSI, Serial and parallel port devices. 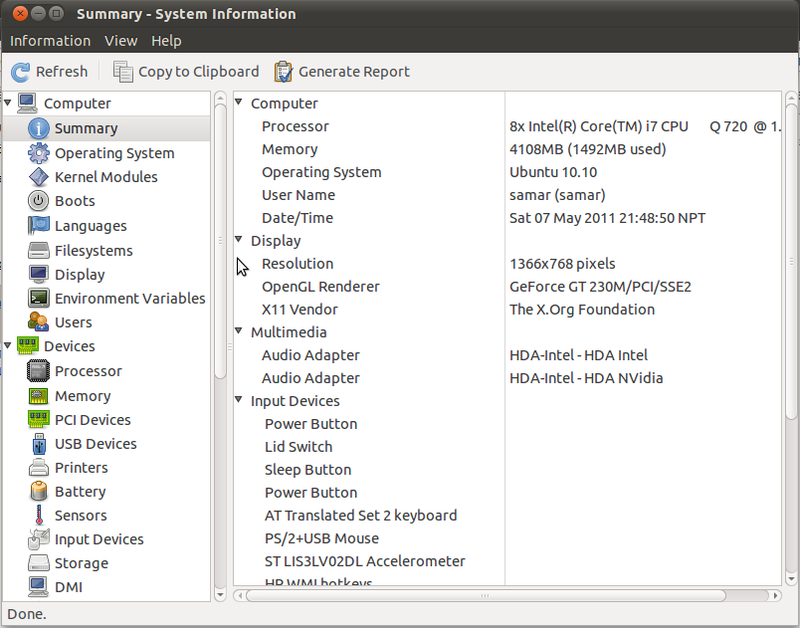 If you know any other such GUI tool, please do comment.